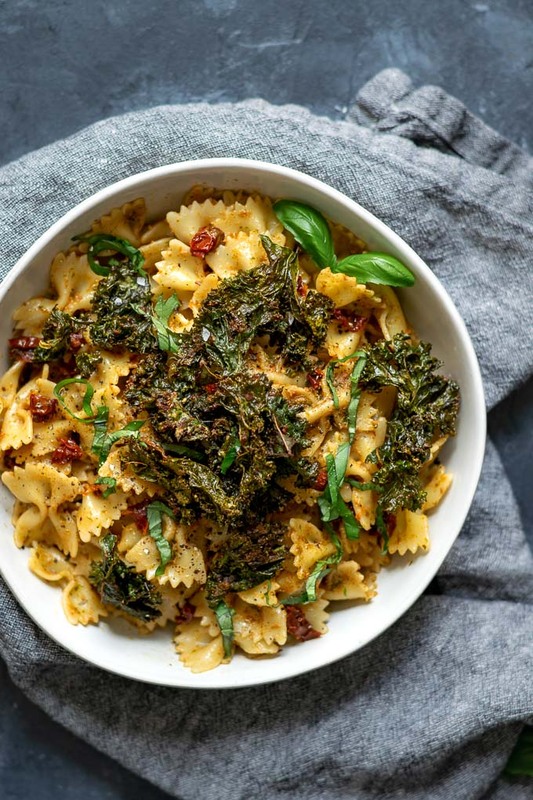 This sun dried tomato and kale pesto is where I’m at right now. It’s got that sweet and tart sun dried tomato flavor. A little earthiness from the kale. The fresh taste of basil. And toasty nutty walnuts. What, aren’t you ready to dive right in already??? 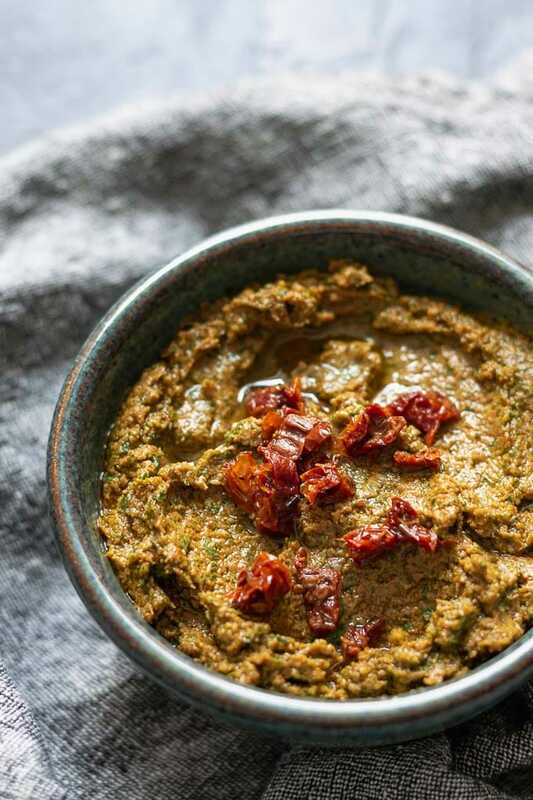 This sun dried tomato pesto is good on everything (I mean, within reason–don’t put it on your breakfast cereal)! Having it in the fridge means easy delicious meals with complex flavors are right at your fingertips. I’m talking pasta, pizza, sandwiches (or paninis-hello! ), veggies like summer squash, and even your kale. Yes, your kale! Because, you know you’re vegan when you make pesto out of kale.. and then put that pesto back on kale haha. But, frankly, that’s something everyone should be doing (apparently) because holy wow, it’s one of the best ways I’ve prepared kale! I used to be such a pesto purist. I wanted my pesto to be made with basil and pine nuts, the first time I saw a pesto with other herbs–other nuts, and other greens–in it, I thought it was a little crazy. But I evolve, foods evolve, and I love trying new things so I branched out, and it was one of the best decisions! Now I’ll put a twist on all my pestos: I’ve got pesto made with pepitas and pistachios, pesto with cilantro to complement the basil, nut free pesto, and pesto with garlic scapes. And all that in 18 months of blogging. Clearly I’m a little pesto obsessed. But thankfully there’s room for a lot of different pestos in my life, because that barely scratches the pesto surface! 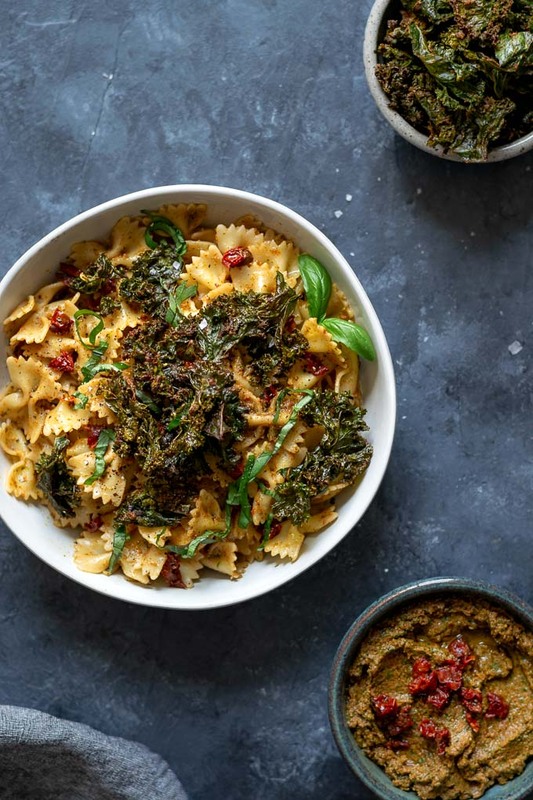 Take this sun dried tomato and kale pesto. I first made the recipe some months ago, when the fridge was nearing empty, and all I had in the way of produce was a few leaves of sad looking kale. I’m sure in your home that you have a never ending supply of fresh vegetables and fruits at peak ripeness, I mean that’s like everyone but me, right? Hah. Just kidding. On this night of a ‘use up whatever’s in the fridge’ meal, I stuffed some chopped kale into my blender with a couple handfuls of dry packed sun dried tomatoes along with some of the other usual suspects (garlic, nuts, salt, olive oil) to make a pesto. I didn’t even have any fresh basil, as at the time my poor basil plant was struggling! That kale pesto was so delicious, I knew I had to recreate it for you! It’s such a fun way to sneak a little kale into your food. Though, um, unless you’re eating the entire jar of pesto it’s not like you can actually get anywhere near counting it as a serving of greens.. 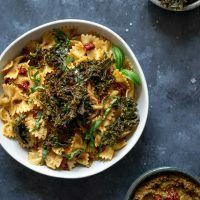 This sun dried tomato and kale pesto is super easy to make. For the base I used walnuts, as they hold up well to the stronger and earthier flavors of kale and sun dried tomatoes. Toasting the nuts before grinding them up makes for the best flavors, and can happen while I prep my kale, sun dried tomatoes, and basil. I like to make this pesto in my blender because clean up is easier. The tamper on my Vitamix helps push the ingredients down so the blades can chop up everything finely. If your blender isn’t up to the task, a great alternative is a food processor! 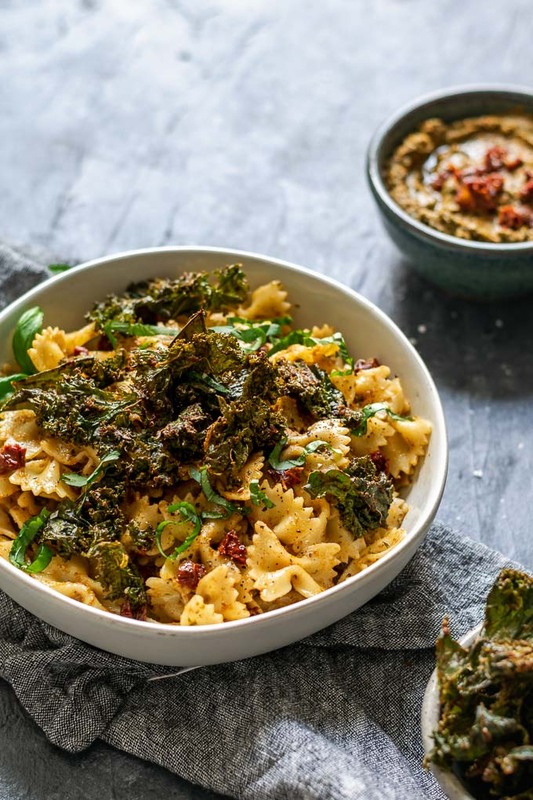 The nuts, sun dried tomatoes, kale, basil, fresh thyme, and garlic get chopped up along with nutritional yeast (or use vegan parmesan) for its cheesy, nutty flavor, salt, and pepper. Once that’s nice and fine, add the olive oil. You want to be careful not to over process the olive oil as this can turn it bitter. This is why I add it once everything is finely chopped, so it can quickly make a paste without much effort of the blender. With the olive oil comes freshly squeezed lemon juice, which also is a bit delicate for blending. And that’s it! Your pesto is ready to go! Scoop it out of your blender and toss it on some hot pasta. Make the most delicious sandwiches. Or, my new personal favorite, make some kale chips with it! So, anyway, make some sun dried tomato kale pesto, toss it on pasta, make pesto crusted kale chips. Top those kale chips on the pasta, and have yourself a delicious and easy meal! Yum, yum. 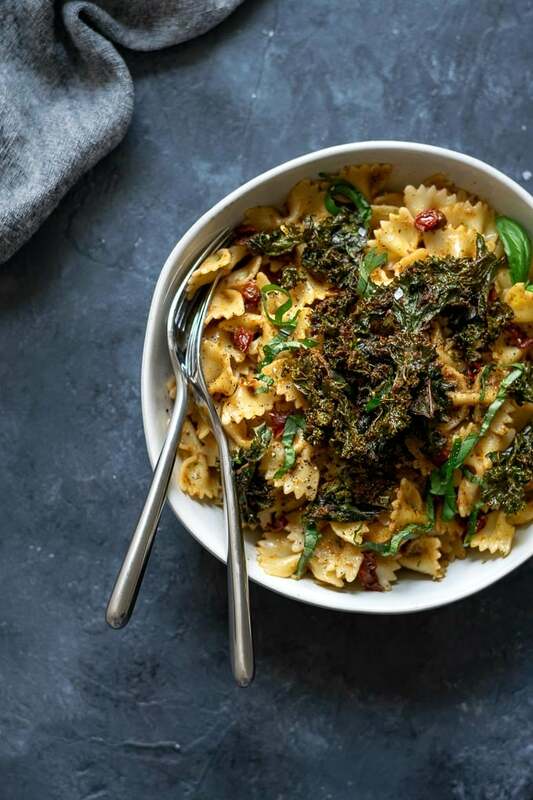 If you make this sun dried tomato and kale pesto leave a comment and rate the recipe below! And tag your recreations @thecuriouschickpea and #thecuriouschickpea on Instagram, I love seeing your photos! Fresh tasting sun dried tomato pesto made with kale, basil, and toasted walnuts. A delicious pesto that's perfect for coating pasta, as a sandwich spread, or for spicing up your kale! Toast the walnuts on a dry skillet over low heat for about 8-10 minutes until they smell fragrant and are a shade darker. 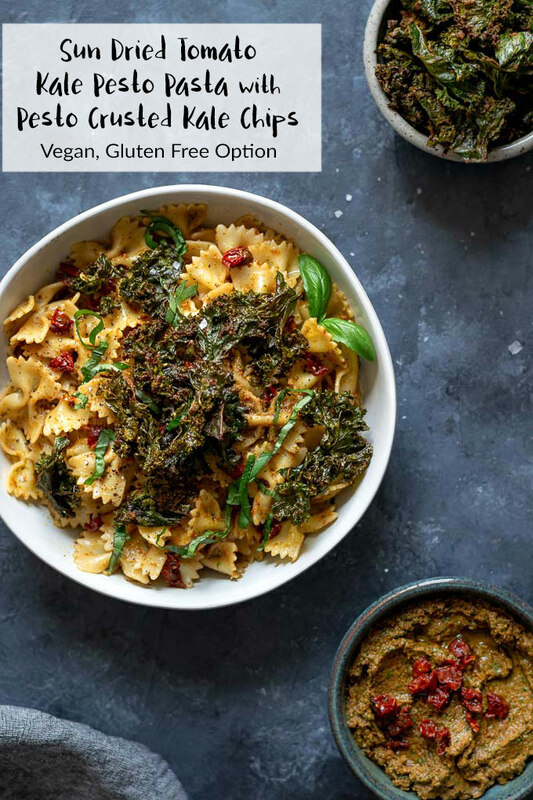 Transfer to a blender or food processor and add the kale, sun dried tomatoes, basil, fresh thyme, garlic, nutritional yeast or vegan parmesan, salt and black pepper. Process until finely chopped. Add the olive oil and lemon juice and process to form a paste. Use right away or transfer to the fridge until ready to use. *If using dry packed sun dried tomatoes and they are no longer soft and supple, soak in boiling hot water to soften before use. You can save this water to thin the pesto a little if desired. To make pesto crusted kale chips: remove the ribs from 1 bunch of kale and coarsely tear the kale into large pieces. Toss with 2 tbsp pesto, or more to taste, and 1 tbsp olive oil. Bake at 350 ºF for 10 minutes, stir, then another 8-10 minutes, until fully dehydrated. Keep a close eye on them so they don't burn at the end. To make pesto pasta: combine about 1/2 cup pesto (more to taste) with 1 lb cooked pasta and some reserved pasta cooking water to thin.